Merry Monday Christmas Challenge: Merry Monday #146....Reminder!! Welcome back to Merry Monday Christmas Challenge! "Remember...create a Christmas card using a Santa!" Have fun! Click HERE to link up your project! Happy crafting!! 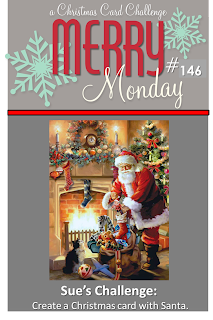 Merry Monday #145 ... Reminder! !